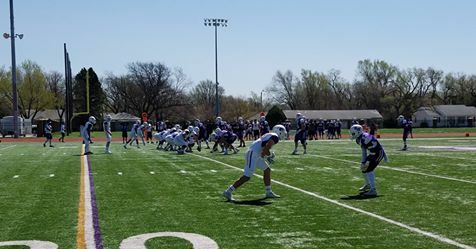 Kansas Wesleyan football fans received an inside look at Coyote football Saturday at the Graves Family Sports Complex. Fans left knowing that the offense should be okay. Quarterbacks Wesley Geisler and Johnny Feauto flashed their abilities on the turf. Geisler connected on a couple touchdown throws, much like newly acquired Feauto from Fullerton College. Both enjoyed the services of tailback Demarco Prewitt and do-it-all player in Johnny Carmack. Carmack also came from Fullerton. The defense did force three turnovers. Linebacker Warren Singletary recorded an interception while linebacker Matt Hubble returned a fumble recovery for a touchdown. The highlight of the day was Brandon Baker. Instead of running for a touchdown, “Dean McQueen” threw a strike to Geisler to close out the day.